It really burns us up that the roofing industry gets such a bad wrap because of a few bad apples. The scammers are always something we have to be on the lookout for. Unfortunately, it just seems to be a fact of life these days. Here are the most common scams we come across, and some tips for how to avoid them. This is one of the worst types of scams. In this instance, a contractor or someone who claims to be a contractor, will start off by appearing to do all of the right things. They’ll respond to an inquiry you’ve made. They’ll be very friendly, and come out to give you an estimate. You may find that they’ll go out of their way to be personable, working extra hard to create positive rapport. You’ll feel so good about this nice, helpful person that you won’t even question writing them a deposit check for all of the materials or half of the estimate. As soon as the check clears though, you’ll never see them again. And, unfortunately, these guys are so good at covering their tracks, that your chances of ever recovering your money are pretty slim. You can avoid this scam by checking out the contractor in advance. Get their contractor’s license number and check with the state to make sure that they are legitimate. Check out the person you spoke to, not just the company. Get their full name, and look them up on the internet. You can also search the internet for scams in your area. If you find anything in your search that sounds similar to the experience you are having, you should do more research. And, to be safe, you should just probably keep looking for a new contractor. Unfortunately, this is a very common occurrence. Some people wouldn’t even call it a scam. But we think it falls into that category. As with the disappearing act, you’ll start out speaking with a very professional, knowledgeable person who puts your mind at ease. You’ll have confidence that they know what they are doing and have the experience to do the job right because, in this case, they probably do. Everything will be going along just fine until the day work is scheduled to start. The people who show up to do the work won’t be who you were expecting, and they won’t live up to the expectations that were set. You may not even have a licensed contractor on the team that is working on your roof. The person you spoke to will be nowhere to be found, and will suddenly be very hard to reach by phone or email. 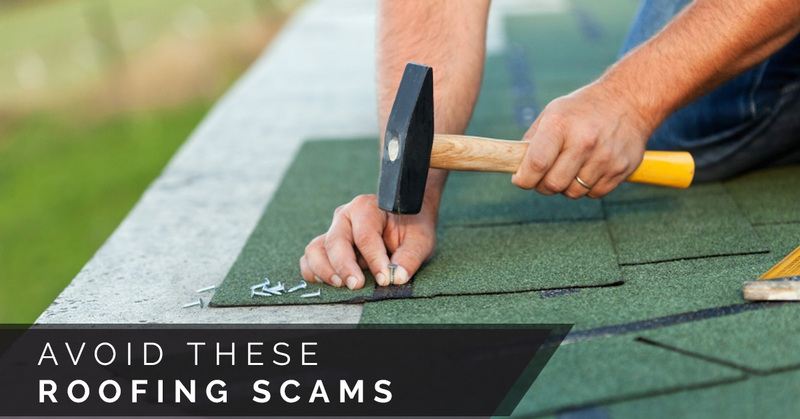 You can avoid this scam by talking to a lot of references, checking the contractor’s status with state agencies, and checking to see what the Better Business Bureau and other authoritative organizations have to say about them. You should also ask the question during the interview process, “will you be here while the work is being done?” If the answer is yes, make sure that you get that in writing in your contract. If the answer is no, find out who will be there, and insist on meeting that person so you can check them out in advance. Some contractors will ask you to sign a contract before they’ll even inspect your roof. This seems odd, right? It is! They’ll explain it away as a liability issue, or say that the contract protects you in the case that anything goes wrong. They are lying. Don’t ever do this. Most likely, what’s really in the fine print of that contract is a clause obligating you to hire them if your insurance company agrees to pay for repair work. This scam may even be combined with a disingenuous offer to do “free” emergency repairs. Nothing is free. It is reasonable for your roofer to markup the cost of roofing materials if they are doing all of the planning, ordering, shipping and fulfillment management. That’s perfectly okay. What isn’t reasonable is a big markup. Find out in advance what the markup will be, then do your own research regarding how much materials cost. Make sure you know who manufactured your new shingles, including what the part number is,so you can find out the retail price. Your cost shouldn’t be any more than the retail price. Your contractor is buying them at a wholesale price. If their markup exceeds the retail price by more than one or two percent, don’t agree to pay it. We hope these tips are helpful. If you have any concerns that you might be the victim of a scam, get in touch with the Arizona Registrar of Contractors. They may be able to help. Even if they can’t help you directly, reporting your experience may help protect the next person from getting scammed. And, you can always call us. We’ve been part of this community for more than 20 years. We’re professional, trustworthy, and affordable. You satisfaction is our goal.